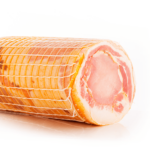 Our Cacciatori recipe follows the Northern Italian style to make a small, ready to eat and flavoursome ‘meal’ wrapped in a natural casing package. 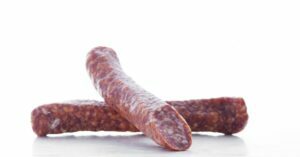 It is a fully fermented, slow dried and all pork salami with the aromatic flavours of caraway, coriander and fine black pepper. 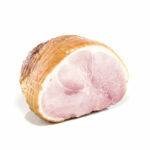 This cacciatori can be eaten as is, on the run or sliced generously for a mixed grill plate. Cacciatori comes with a mild flavour or with the distinctly hot characters of hand crushed chilli. Lightly fry some in new season olive oil and serve pronto with chunky Australian fetta, chick peas, white onions and slivers of yellow capsicum. Ingredients: Pork Meat (95%), Salt, Skim Milk Powder, Lactose, Dextrose, Spices, Maltodextrin, Sugar, Red Wine (contains milk derivatives), Antioxidant (316), Dehydrated Vegetable, Sodium Nitrite (250), Culture, Natural Flavouring.